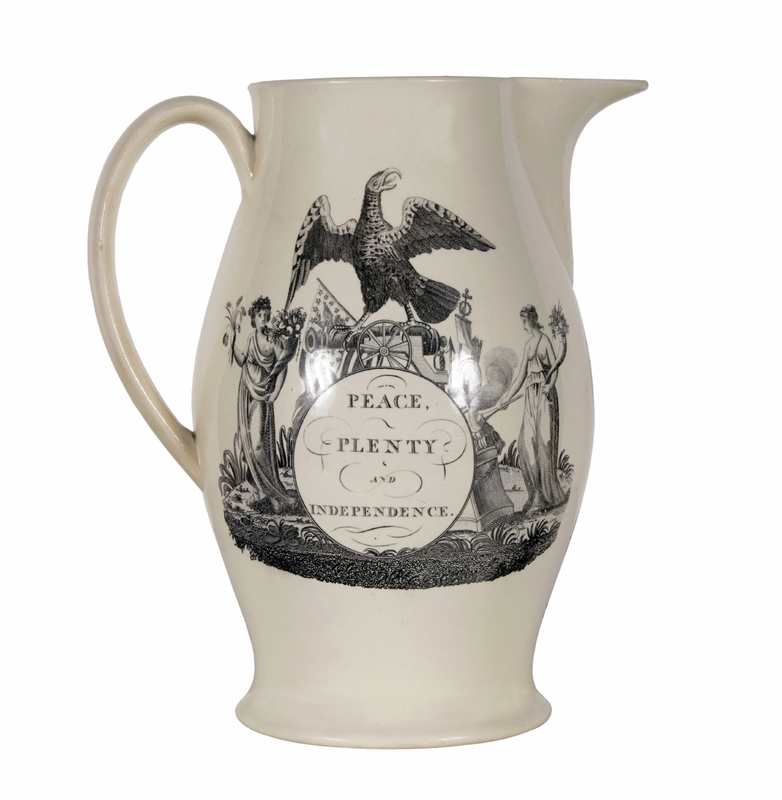 Dimensions (inches): 10" x 10" x 6.5"
Large Liverpool jug (pitcher) with American patriotic imagery. 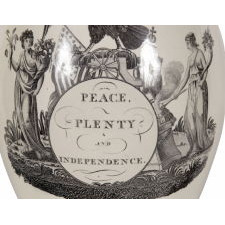 This consists of a memorial to George Washington on one side and a scene entitled "Peace, Plenty and Independence" on the other. 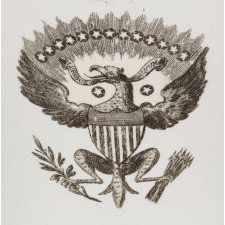 The latter view consists of an eagle, perched upon a cannon, about which lay other tools of war. 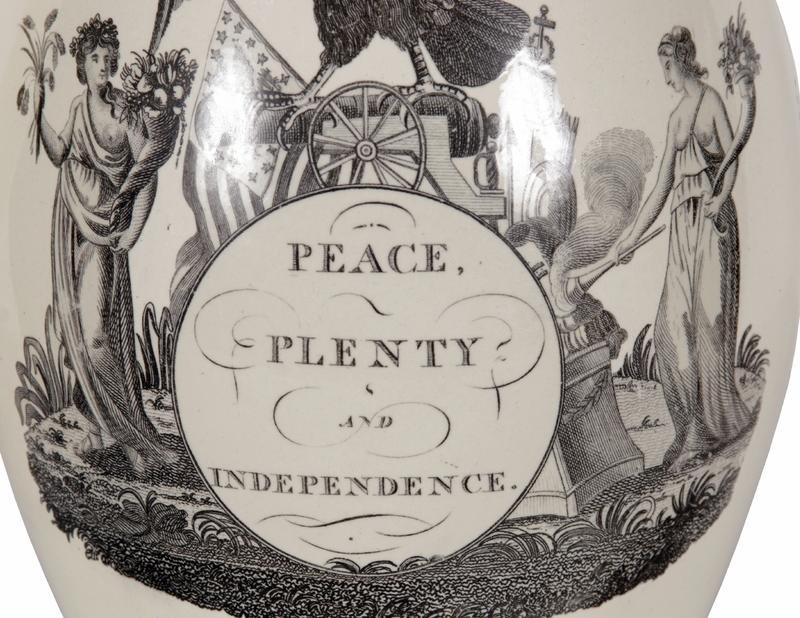 Figures of Lady Columbia, to the left and right, presented in a style to represent the Goddess of Plenty, bear cornucopia, wheat sheaves, and light a beacon to mourn its sons and signal the strength of the new nation to the world. 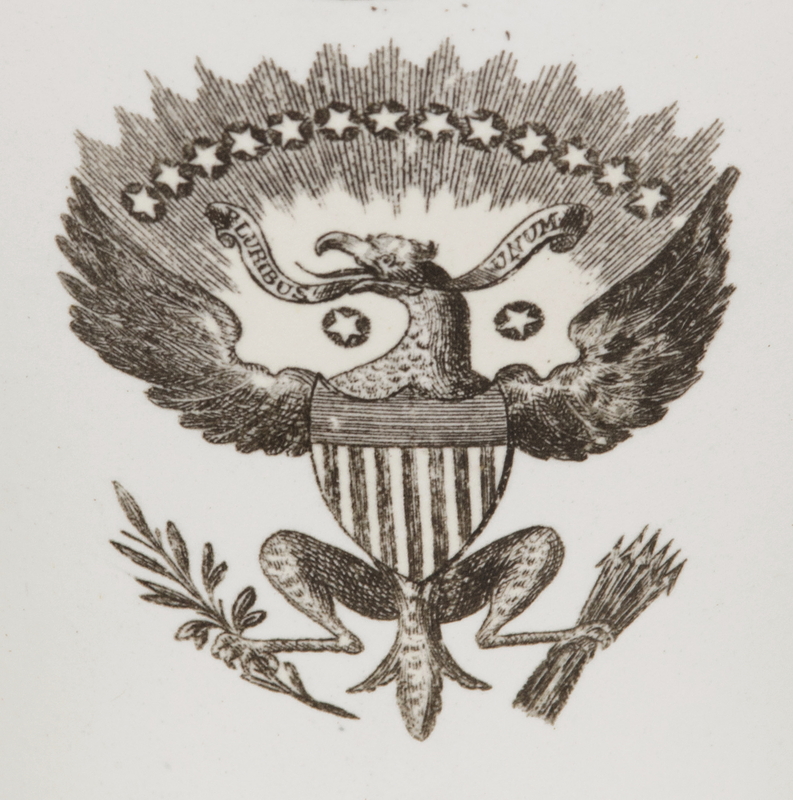 Behind these, canted to the left, is an American national flag with an eagle in the canton and a count of 13 stars. 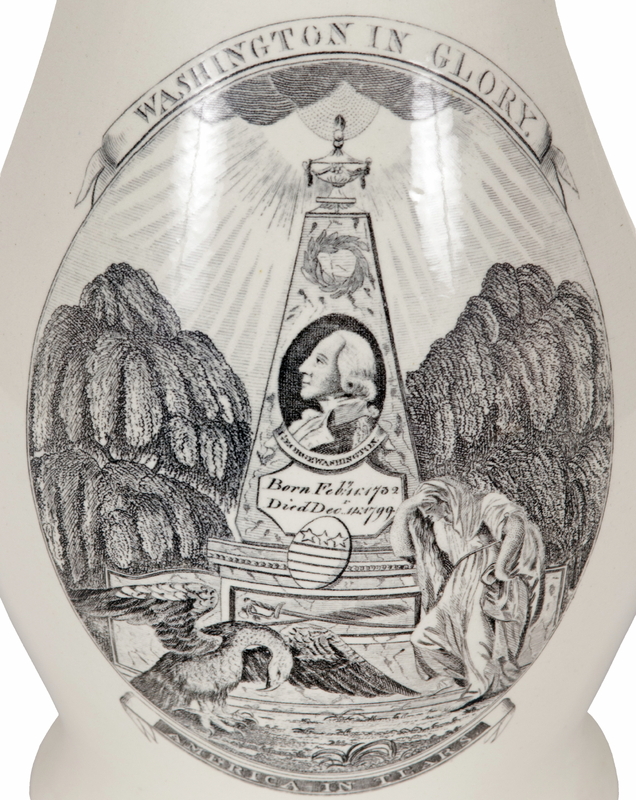 The Washington image is one of several known views on Liverpool transferware. 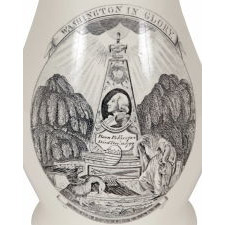 Captioned "Washington in Glory. 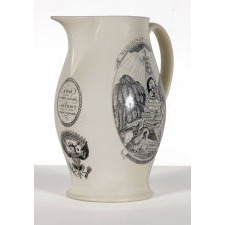 America in Tears.," the centerpiece is an image of a monument with a portrait of the late president and general, beneath a laurel wreath, etched below with his name, date of birth and passing. 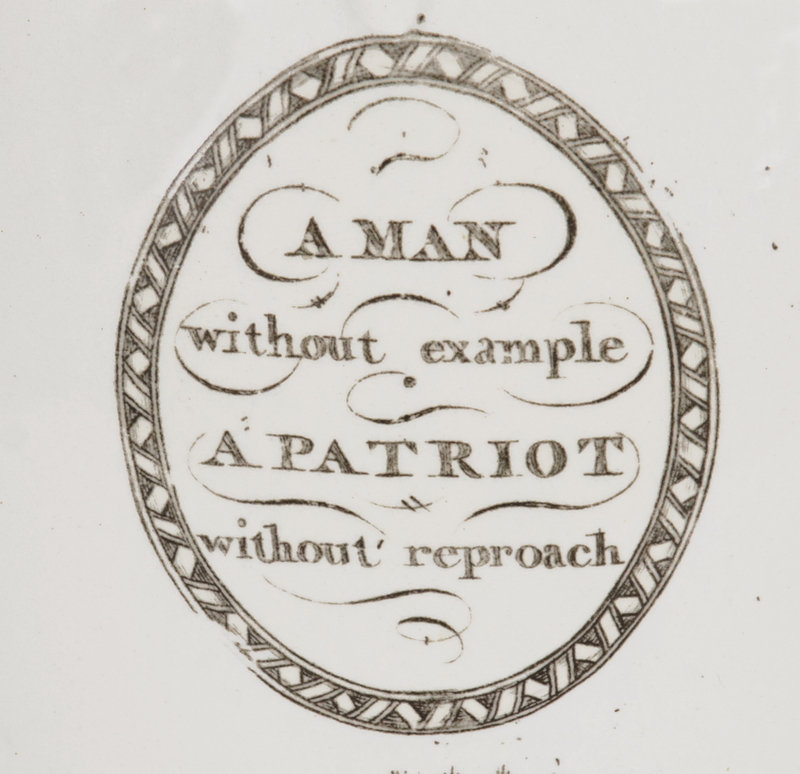 The base is decorated with a crossed sword and quill, exemplifying his strengths. 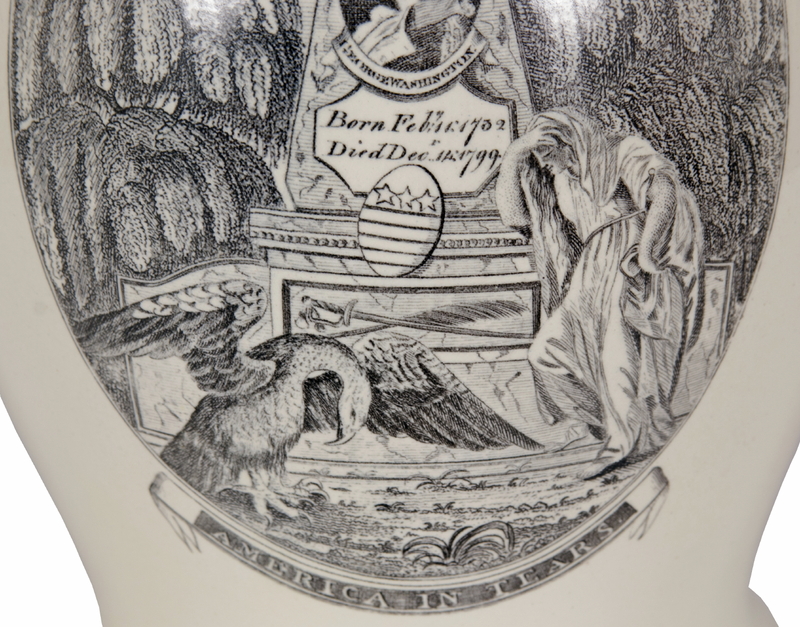 An egg-shaped federal shield rests against the stone to represent the birth of independence, while the American eagle and Lady Columbia bow their heads to each side in mourning, flanked by Willow trees. 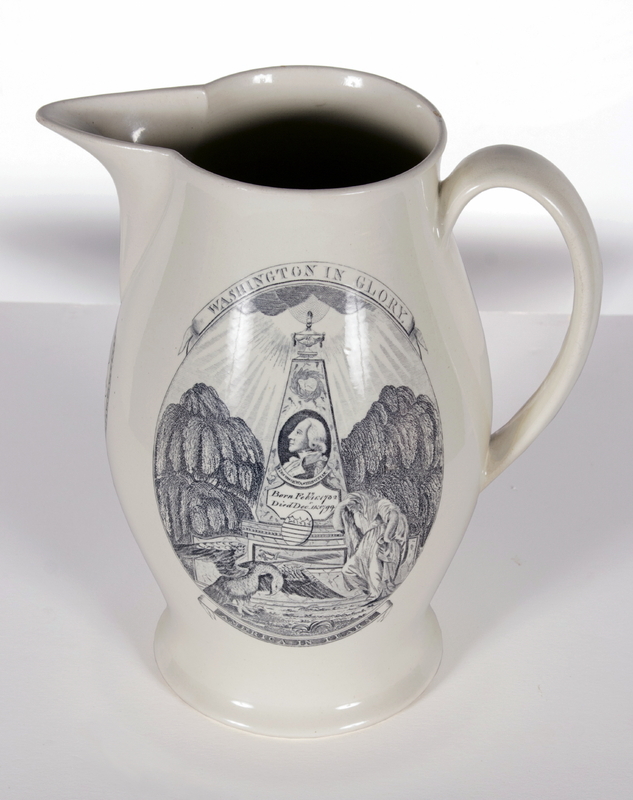 Beneath the spout are two more patriotic emblems, including an oval medallion with a tribute to Washington that reads: "A man without example. 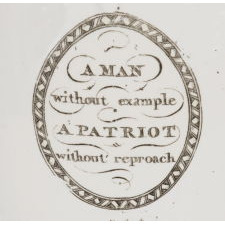 A patriot without reproach," along with a third eagle in a rendition of the Great Seal of the United States, with 13 stars arched above and two more to either side of the eagle's neck to represent Vermont and Kentucky. 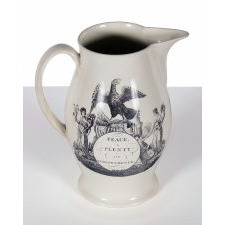 Made circa 1800-1805, the jug is attributed to Herculaneum Pottery in Liverpool, England, which produced earthenwares and porcelains and was active between 1793-1841. 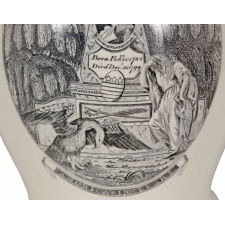 To achieve this sort of decoration, engraved images were applied by pressing a paper pattern on the pottery while the ink on the paper was still wet. Glazing then sealed the design and clay. 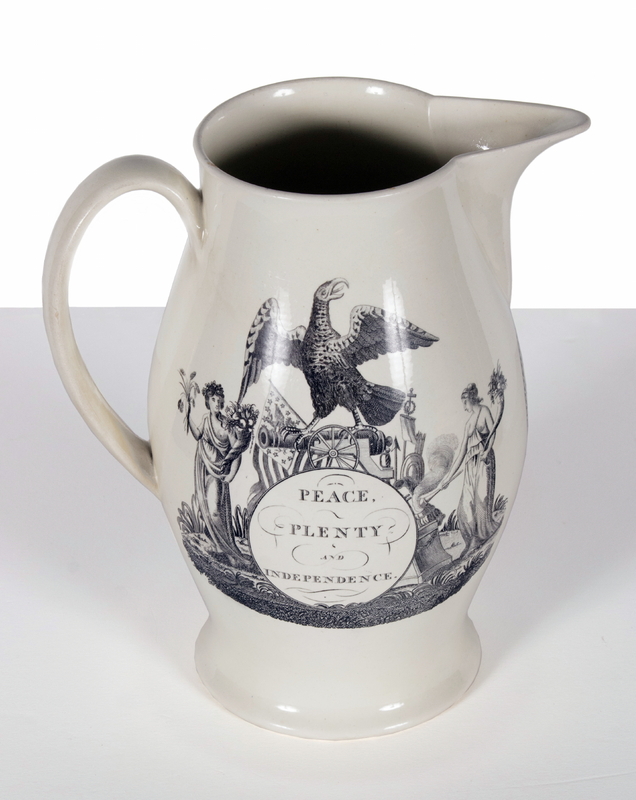 Called "cream ware," these pieces were intended for the American market, advertised in American seaport newspapers, and designed for to appeal to American sentiment and patriotism. 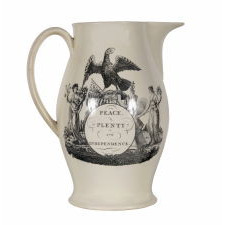 Herculaneum was the largest exporter of transfer printed ceramics to America during the federal period. 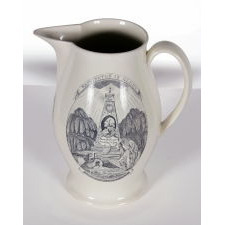 An example of this jug with this Washington mourning image (though with a different transfer on the other side) is held in the collection of Mattatuck Museum on Long Island and documented by Marian Klamkin in "American Patriotic and Political China" (Charles Scribner's Sons, New York, 1973), as figure 74 on p. 62. 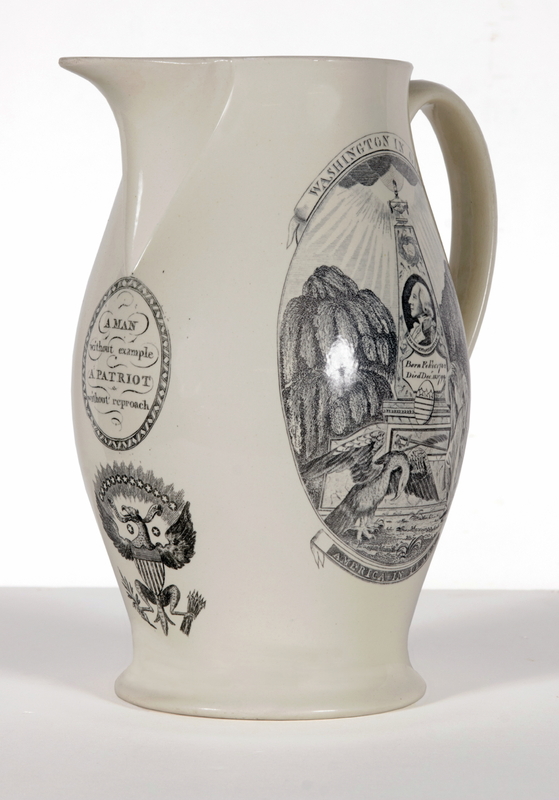 Another version with this image is documented by David & Linda Arman in "Anglo-American Ceramics: Transfer Printed Creamware and Pearlware for the American Market, 1760-1860," (Oakland Press, 1998), on p. 207. Condition: Excellent, with only slight yellowing of the glazing.